High school football season arrived early Thursday night in Murfreesboro when Oakland made the short trip down the road to Riverdale to play in one of the, “Great American Rivals” games. The “Great American Rivals,” are 85 chosen games throughout the country, and the first one of the season was played in Murfreesboro. However, generally when you think of a great rival game you think of a game that goes down to the wire, and this one was far from that. With a packed house at Tomahawk Stadium, Riverdale won the toss and selected to receive, hoping to put quick points on the board and get the big crowd on their side. After the opening kickoff was a touchback through the back of the endzone Riverdale took over at their own 20 but managed only Oakland 40 before they were stopped and forced to punt. Riverdale kicker, Kyle Bennett, did exactly what he wanted to do, pinning Oakland back on their own 12. That was where the good news ran out for Riverdale. The first offensive play for Oakland, running back, Fred Wade, took a handoff right up the middle for 88 yards and the opening touchdown of the game. 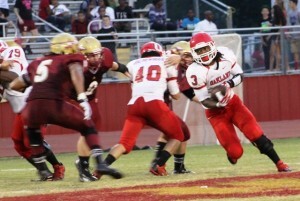 After the big play by Oakland, Riverdale was determined to drive down the field and answer with a score of their own. However, that drive only lasted three plays before defensive end, Ty Nix, jumped a screen pass for a pick six. 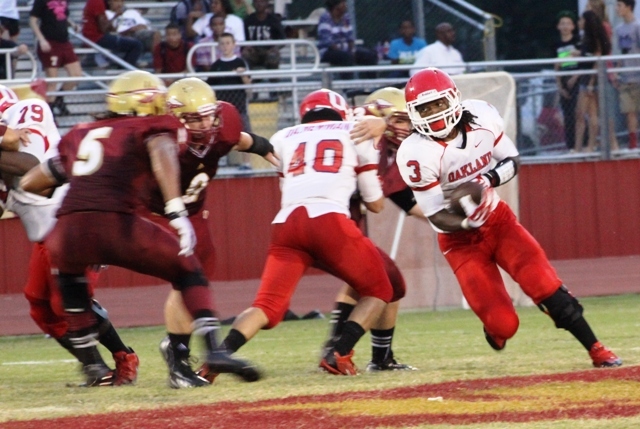 The game wasn’t even halfway through the first quarter and Oakland was up on Riverdale 13-0. While Riverdale looked to get something started, Oakland’s defense held them to a four and out, refusing to let the Warriors of Riverdale get any momentum. In Oakland’s next drive it seemed as though things might be changing as the Patriots lost a fumble that left Riverdale to start at mid-field. They would, in return, hand the ball back over in a failed wide receiver reverse. From there, Oakland would march the ball down the field, running out the first quarter. It only took till the second play of the second quarter, however, before the Patriots put more points on the board. Quarterback, Rhett Stacey, saw a one-on-one matchup on the outside and audibled to get his man the ball. He threw a quick pass to Tyler Black, who beat his man and strolled into the endzone from 12 yards out to put the Oakland Patriots up 20-0. After what seemed would be another four and out for the Warriors, they caught their first break of the game as a muffed punt gave them a second chance. They would take advantage of their short-lived good fortune, with running back, Ken Collins, giving them a score from 16 yards out. That good fortune quickly ran out though, as Tyler Black would once again show off his moves to take the kickoff from his own one down to Riverdale’s 21 before being dragged down. From there Oakland would punch in another touchdown as Reed Fowler finished the drive off on 3rd down from the one yard line. With just under three minutes to play until halftime, Riverdale came out after the kickoff trying to run the clock out and stop the bleeding. The other sideline had other plans however, using all three timeouts to keep the clock from running to force Riverdale into a long 3rd down. With the only option to pass to complete the first down, the Patriots brought the house. They got to the quarterback and stripped the ball where Austin Barrett would scoop it up and run it in for the score. For the Riverdale fans halftime had finally arrived, but the scoreboard still read 34-7 in favor of the Patriots. The second half of the football wasn’t as exciting. Fred Wade put six more on for the Patriots in their second possession, however. Wade’s second score seemed to deflate Riverdale. Seeing this, Oakland put their second team in and both teams swapped punts until the final horn sounded. In the end, Oakland saw itself go into Tomahawk Stadium and completely dominate from the very beginning, the final score being 41-7. Fred Wade was named the “Great American Rivals” MVP. having two scores and rushing for 168 yards to begin the season. The battle in the ‘Boro to start the season was not exactly a nail bitter, but it did welcome another season of high school football back.